PH value in the wort in the mashing phase is a very important parameter to assure the perfect conversion of starch in simple sugars. The possibility to measure this parameter in wort allows to make the necessary adjustments immediately and to reduce the time of the mashing phase. 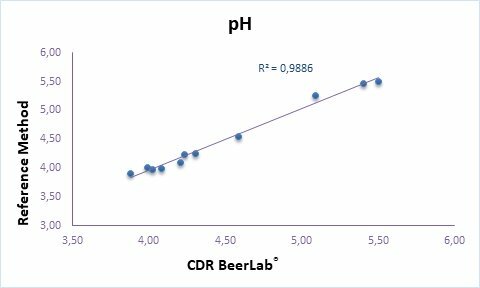 The analysis method of CDR BeerLab® systems is correlated with reference potentiometric method with ph-meter, it can be performed in few simple steps obtaining in 1 minute accurated and precise results. You do not need to calibrate the instrument nor to use calibration solutions, making the analytical control procedure clear and reliable. pH can be measured using CDR BeerLab®, a system which enables you to carry out a wide panel of chemical analyses on beer and water, using a single instrument, in a process that is faster and simpler than traditional methods. Are possible test sessions with several samples, up to 16 tests for CDR BeerLab® and 3 tests for CDR BeerLab® Junior. pH value determination is made through a colorimetric acid-base reaction in which a phenol derived, added to the matrix to be analyzed, causes a variation of the coloration. The magnitude of the coloration, measured at 630 nm is correlated with the pH of the sample. The reagents have a shelf-life of 6 months. For an adequate accuracy it is necessary to centrifuge the wort sample before carrying out the analysis. pH was last modified: February 19th, 2019 by CDR s.r.l.